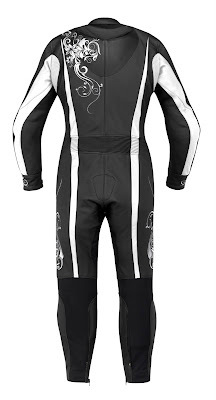 Brand new for 2011, the Alpinestars Stella Anouke Leather Suit is a women's-specific race suit that touts all of the features and technicality that the AStars men's suits do. In an industry where women are often the outsiders, we're happy to see Alpinestars starting to pay more attention to female sport riders. The Alpinestars Stella Anouke Race Suit is inspired by the Anouke leather jacket, one of the all-time bestselling Alpinestars female leather jackets. This is designed and built from the ground up to contour to a woman's shape and curves. The result? A suit that will perform extraordinarily well on the race track. The Stella Anouke Suit is built from premium 1.3mm full-grain leather that is safety stitched throughout for exceptional abrasion and tear resistance. There are perforated areas of this leather that allow a good amount of airflow with additional ventilation being provided by the aramidic stretch panels that can be found at the arms, backs of legs, and at the crotch. These panels are reinforced for abrasion resistance but also allow a great deal of mobility. Adding to the ease of movement are accordion leather stretch panels, located at the side of the torso, the shoulders (and underarms) and the lower back. There is a sport back hump that assists with aerodynamics and also protects in the event of a get-off. For armor, there is CE certified proprietary GP protectors at the shoulders, elbows and knees. These are AStars' pro-level protectors, constructed of an injection-molded hard shell and backed by a dual-density foam padding. This suit also features the snap-in system for Alpinestars Bionic Race Back Protector which provides CE level 2 protection. There is additional protective foam padding that can be found in the hips, tailbone and chest of this suit. The PU sliders are completely replaceable and the comfort mesh liner (which has built-in flex zones) is removable and washable. This suit uses flat YKK zippers throughout with autolocking zippers at the cuff. Alpinestars truly didn't spare a penny with the brand new Stella Anouke Suit.